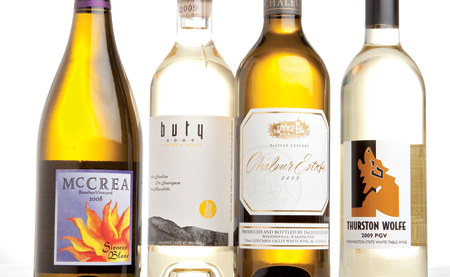 From chardonnays to sweet wines, our picks for the very best white varietals in Washington state. The 2008 vintage has been touted as one of the best for white wines in Washington. A cool spring created great acidity and smaller berries that developed slowly, while a hot summer brought ripe lushness to the fruit but with a pleasantly lower alcohol level. This 100 percent Chardonnay—a mix of fruit from vineyards mainly on the Wahluke Slope in Grant County, including Indian Wells Vineyard—is made in Woodinville in the New World style, aged in French oak barrels with some malolactic fermentation and seven months of sur lies, giving it a nose of tropical fruit and butterscotch, making it that big, buttery Chard so many people love. Hugh and Kathy Shiels and their winemaker daughter, Kerry Shiels, make a great team. They showcase this delicious Chardonnay from their own DuBrul Vineyard in Yakima Valley in their new tasting space at Urban Enoteca in Seattle. It speaks to an elegant Chardonnay style with citrus, apple and pear aromas, the great acidity that Chardonnay can achieve if managed correctly, and not too much oak. A lovely example of Washington Chardonnay. Among Viognier fans, Jarrod and Ali Boyle’s wines are perennial favorites. This year, their Crawford Vineyard Viognier rose to the top, with its exuberant stone fruit, aromas of candied peach, dust and white flowers, and full but balanced mouthfeel. Sixty-one percent of this Horse Heaven Hills–based winery’s Viognier comes from its own Destiny Ridge vineyard in the Horse Heaven Hills, but this one highlights a delicious blend with 39 percent fruit from Crawford Vineyard in Prosser. Savor a glass at the cozy tasting room in Woodinville. Now here’s a Riesling even the most patriotic German could love. The lone white from CNN producer-turned-Walla Walla–based-vintner Steve Brooks is fairly low in alcohol (12.4 percent), accentuating its clean, crisp quality. Pretty in peach and citrus flavors, the wine also screams “Let’s rock,” as judges noted this gem’s minerality. Sadly, the vintage is sold out, but the consistency of this wine, made partly with grapes from the popular Evergreen Vineyard in Washington’s potential new appellation, Ancient Lakes, makes next year’s vintage worth trying. In our blind tasting, this Horse Heaven Vineyard Sauvignon Blanc impressed with its grass, lemon zest and peach aromas. One judge called it “pretty and balanced,” and it shows the characteristics of Washington Sauvignon Blanc—riper than French or New Zealand Sauv Blanc, but with acidity that balances. These grapes were plucked from the vines just weeks before winter set in, making for low-yield, intensely flavorful fruit. The superlong hang time brings out apricot and peach qualities, as well as dabs of butterscotch and caramel, but not in a cloying way. There’s plenty of acidity to balance the complex fruit in this Walla Walla sipper. With a dedication to Riesling in general and late-harvest Riesling in particular, Chateau Ste. Michelle has a stellar stable of dessert wines. This Horse Heaven Hills Riesling infected with the “noble rot” of Botrytis cinerea—a desirable fungus that gives the grapes a highly concentrated sweet lushness—was our favorite, with luscious apricot, white peach and spice aromas and flavors, and a honeylike, silky viscosity that isn't overly sweet. Buty has been a crowd pleaser since the Walla Walla winery’s first vintage in 2000. This traditional Bordeaux partnering of Semillon and Sauvignon Blanc adds a floral wild card with the lesser-known Muscadelle, which winemaker Caleb Foster sourced from Lonesome Spring Ranch in Yakima Valley, perhaps as a nod to his early years working in New Zealand and South Africa, where that grape is known as Tokay. In the capable hands of Woodinville winemaker Chris Upchurch, Sauvignon Blanc and Semillon from some of the state’s most renowned vineyards (Boushey, Klipsun and Sagemoor) are transformed from two grapes into one spectacular sipper. It has a buttery rich mouthfeel that will appeal to Chardonnay drinkers as well. When it comes to Rhône-style wines (made from Syrah, Grenache, Viognier and almost two dozen other grapes), McCrea Cellars, with its new tasting room at Urban Enoteca in Seattle's SoDo neighborhood, is the gold standard. Not only are both the red and white wines well made and focused on the great flavors and complexity of Washington Syrah, Grenache and their friends, but the sheer number of fascinating wines it makes is a joy. The winner this year is a delicious Rhône-style white blend of Grenache Blanc (just 1 acre exists in the state), Marsanne, Roussanne and the peppery gem of a Rhône variety, Picpoul, which also is grown on only 1 acre in Washington. With a cooler vintage in 2008, the fruit took longer to ripen and barely reached 24 degrees brix (the optimal sugar level in grapes for wine making). This kept great acidity and complexity of fruit flavors for a wine that's a winner now—and should age beautifully. Not a common blend, this Pinot Gris/Viognier brings together the fresh pear and acidity of Pinot Gris with the lushness and floral aroma of Viognier. Wade Wolfe and Rebecca Yeaman started Thurston Wolfe in Prosser in 1987, making it one of the pioneering wineries in Washington. Along the way, Wolfe consulted for many others, including Chateau Ste. Michelle, and then worked as viticulturist and general manager for Hogue Cellars, in many ways working to put Yakima Valley on the map. Thurston Wolfe has always been an innovative, experiment-driven winery, producing everything from Cabernet Sauvignon to Zinfandel, winning many awards over the years.